From the hot and dry Arizona desert to Florida’s heat and humidity to the temperature extremes in the Midwest and coastal areas, windows and patio doors made with Quanex’s proprietary MikronBlend® Vinyl are field-proven to stand the test of time, surpassing strict industry measures for colorfastness and UV degradation. Windows featuring MikronBlend Vinyl won’t chalk or appreciably fade, even after years of weather and sun exposure. Industry standards prescribe ASTM test procedures that verify MikronBlend’s Delta-E performance—all backed by our industry-leading warranty. 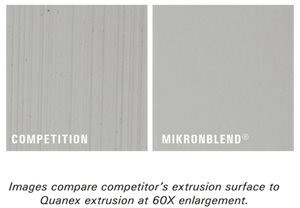 To ensure premium quality, we perform accelerated weather tests using our Xenon-Arc QUV test chamber to ensure MikronBlend Vinyl performs to high standards—which backs up your reputation. We even test competitive vinyl extrusions to carefully benchmark our performance claims.